This nourishing breakfast bowl is the perfect substitute for the usual sugar-loaded cereal or oatmeal. It's high in protein and healthy fats while being low in sugar and refined carbohydrates. 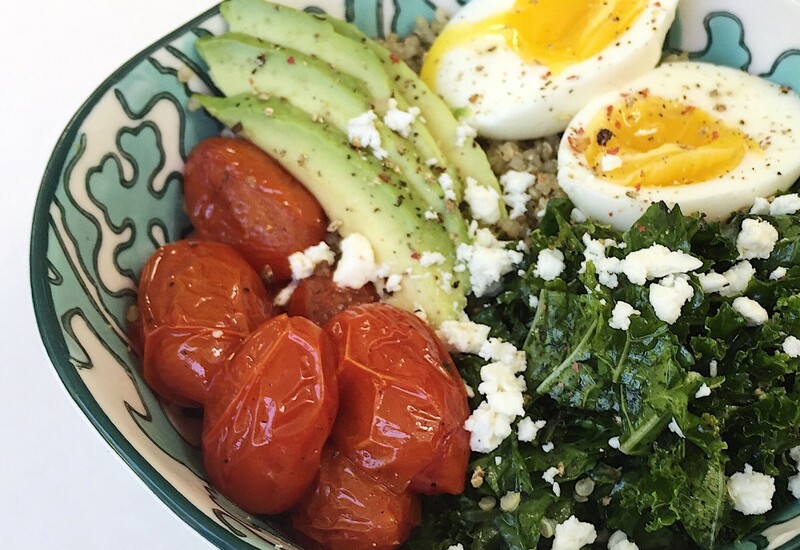 Eat this bowl in the morning and you'll feel energized through lunch! Quinoa is seasoned with oregano and garlic then served with lemon kale, tomatoes, avocado and a soft boiled egg. Best of all it is ready to eat in less than 30 minutes! For perfect soft boiled eggs, bring enough water to cover the eggs to a boil. Reduce heat and carefully add the eggs. Simmer for 7-9 minutes, depending on the size of the egg. Transfer to an ice bath until chilled. Make the quinoa ahead of time for a quick breakfast! Per Serving: 485 calories; 30g fat; 45.3g carbohydrates; 14g protein; 93mg cholesterol; 1465mg sodium. I am new to the savory breakfast dishes, but I love it! I used spinach instead of kale, and a fried egg instead of soft boiled. It was really delicious and filling. The perfect way to start my morning! I'm addicted to this savory quinoa breakfast bowl! I love the garlicky flavor with the avocado. I also sometimes like to use a fried egg instead of soft boiled. So simple and delicious. I used oatmeal instead of quinoa and pressure cooked soft boiled eggs. Perfect weekend breakfast recipe. I love savory breakfast bowls! I've made this with oatmeal instead of quinoa. I also topped it with feta cheese. Made the soft boiled eggs in my pressure cooker and they turned out perfect. When I'm running short on time, I skip the egg all together and serve it with just quinoa. Iusually make the quinoa the night before so that in the morning it's simply grab and go.